My work focuses on the processes of global change and transformation that take place over and above the state that I examine through a social-relational dialectical approach. My work is based in Critical International Relations Theory. Substantive areas of engagement include: processes of mutual recognition across borders in world politics; global responses to climate change and ecological crises; accountability efforts in global governance; the problems of assassination and tyrannicide. Since completing my PhD in 2011, I have been a research fellow at the University of Helsinki, a postdoctoral fellow at the University of Queensland, and a research fellow at Griffith University (2014-present). I have published widely in critical International Relations theory, having edited four books and three journal symposia. I am co-founder and co-editor of the journal Global Discourse and sit on the editorial board of Globalizations. My work focuses on the processes of global change and transformation that take place over and above the state. 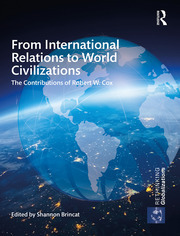 In particular, I have examined how peoples have sought to expand the circle of inclusion in political community through processes of mutual recognition and dialogue across borders in world politics. Other substantive use areas include global responses to climate change and ecological crises, accountability efforts in global governance, and the problems of assassination and tyrannicide. I have also investigated the continuing impact of dialogue and discourses in socialist thought, including field-work in Cuba in 2016 investigating current forms of socio-political change underway on the island. My current major project focuses on dialectics – a unique form of thinking through dialogue with others – and how different cultures and societies have utilized such knowledge across history. Here, I have shown how dialectical thinking can help us mediate the accelerating ecological and political challenges facing humanity today.